Do you have a little cowgirl at home like I do? 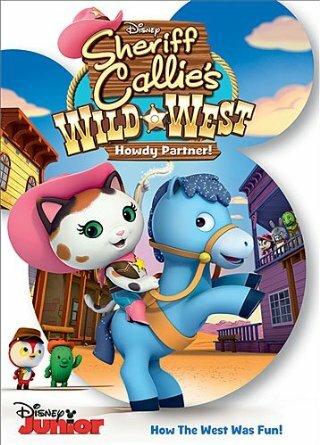 Well then welcome to "Nice and Friendly Corners," where lovable Calico cat Sheriff Callie (voiced by Mandy Moore), along with her deputy woodpecker Peck and their fun-loving cactus sidekick Toby, watch over their pleasant little frontier town, ensuring that everyone follows the "Cowpoke Code" of fairness, honesty, hospitality, cooperation and hard work. Utilizing the folklore of the Old West to impart lessons about good morals, manners and social ethics for kids age 2-7, "Sheriff Callie's Wild West" is the perfect mix of good ol' friendship and laughter for your little one. Filled with 5 action-packed episodes and a FREE exclusive pop-up play set packed inside, bring home the first Western for preschoolers with “Sheriff Callie’s Wild West: Howdy Partner” on DVD Tuesday, October 13th! My daughter loves to play Sheriff Callie so much she even has her light up pink cowgirl hat so I know I better be on my best behavior when the Sheriff comes riding into town. She even had some time to play with the pop up play set before she got down to serious business. I love that Sheriff Callie teaches good morals, manners and great social ethics. It's definitely a win win situation for everyone.